Manufacturing inventory software does not have to be complex, expensive and disconnected from the every day operations on the shop floor. With QR Inventory, you can keep track of inventory levels, build assemblies according to the bill of materials, track manufacturing workflow and collect data on the shop floor and in the warehouses in real time using mobile devices. 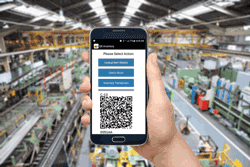 Your employees will be able to use regular smartphones or tablets for QR code / barcode scanning, filling out mobile forms, tracking manufacturing process progress and data look up. Information collected with the mobile devices is sent to a secure centralized cloud location and is instantly available to all authorized users. Track inventory on the shop floor during manufacturing process in real time. Use mobile devices for barcode scanning and processing inventory transactions. Avoid problems caused by delayed entries into a desktop manufacturing inventory system, manual data entries, spreadsheets and paper notes. Track materials, parts and finished goods in multiple locations: warehouse(s), shop floor, job shop, in the field in real time, as manufacturing operations are taking place. Use barcode / QR code / NFC tags scanning for data access and collection. Avoid errors caused by manual entries. Use regular smartphones or tablets for barcode / QR code scanning, data entry and look up. Since each employee has a scanner (smartphone) in his or her pocket, there are no delays in inventory updates. Customize inventory tracking and data collection process to your manufacturing workflow. Create custom transaction types and define what information to collect via a web dashboard. Improve your information flow: collected data are sent to a secure centralized cloud location and are immediately available to all authorized users / devices. QR Inventory is integrated with MISys Manufacturing software. Send data collected on the shop floor to MISys Manufacturing in real time. Use mobile forms to collect all necessary data for accountability and reporting on the shop floor using a smartphone. You are in full control of what data to collect. Create custom mobile forms via a web dashboard, change as needed. Your employees will always have the correct forms to fill out on their mobile devices. Inspections, quality control, checklists, data recording, etc. - any type of forms that you need for your manufacturing process can be created, filled out, securely stored and accessed at any time. Create custom mobile forms via a web dashboard. If / when you change workflow or a process, update forms as needed. Your employees can download and fill out mobile forms on their mobile devices (smartphones, tablets) on the shop floor as each project step is completed. If a supervisor needs to verify and sign off on the completed task, an employee can collect a signature on the mobile device and include it as a part of the submitted record. Instantly create pdf documentation for internal use, customers or outside auditors. View, print, e-mail pdf documents from the smartphone or using a web dashboard. Define looks and layout of pdf documents using custom templates. Always know the status of the current projects. Define workflows via a web dashboard, and let your employees track projects progress on the shop floor using mobile devices and barcode / QR code scanning. Link mobile forms to the workflow steps - and your employees will clearly see what form(s) they need to fill out. Review a complete history of the project or product batch: dates, employees involved, who did what, collected data and forms filled out on each step. Create custom workflows/processes via a web dashboard. Create workflow steps, and, optionally, mobile form(s) that need to be filled out on each step. Provide instructions for each step to guide your employees through the manufacturing process. Employees can access project status, instructions, fill out necessary forms and move the project to the next step on site using their smartphone. Receive an e-mail alert when the project is moved to the next step, or if there is a problem during inspection or quality control. Get a real time 360 degree view of the current projects and work in progress. Access an entire history of each project / product batch. Filter data by multiple parameters to find required information fast. Achieve forward and backward traceability of inventory, parts and materials. Pin-point and eliminate defficiencies in the production process before they lead to a larger problem. Quickly locate and recall all products that may be defective or contaminated. Track inventory by a lot number / batch number or serial number. Record all batch information on site on a mobile device, as soon as material is produced or received. Access batch information by scanning QR code or barcode with a smartphone. Track lot numbers of the materials that go into intermediate or finished products. Scan in lot numbers instead of entering them manually to avoid mistakes. Track product batch through the process, from the origin to distribution, by scanning QR code / barcode and recording necessary information on a smartphone. Fill out quality control forms and checklists on each step of the process. Locate and correct deficiencies fast, before they lead to a larger problem. Produce a proper documentation chain and restore every step of the process if necessary. Produce required manufacturing process documentation instantly, store in a secure cloud for on semand access. Send documents to Sharepoint intranet for team review and collaboration. Generate PDF documents for the production process instantly on the mobile device, or later in the office via the web dashboard. View, print and / or e-mail pdf reports directly from a smartphone, or from the office computer. You define PDF reports looks and layout via custom templates. Include your branding, information on your company, product information, collected data, images and signature. Use PDF reports for internal communications, customers and / or outside auditors. Send documents to sharepoint intranet for team review and collaboration. Create a list of materials (BOM) that go into an assembly. Track building of serialized and non-serialized assemblies on the shop floor using mobile devices and barcode scanning. Find what materials batch and which serialized assets went into each assembly. Specify components list (BOM) that go into each assembly. Track building of assemblies on the shop floor by scanning components with a smartphone. When assemblies are built, components are automatically subtracted from the inventory, and assemblies are added. Build unique on-demand or serialized assemblies, and keep track of serial numbers / batch number of the materials used in each assembly. Add the same set of items to multiple assemblies at once. Keep track of the work in progress on building serialized assemblies. Create a generic components list for serialized assemblies. Build assemblies against the list by scanning the actual components batch number / serial number.